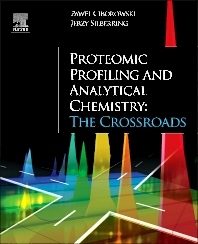 ﻿ Nowy podręcznik prof. Silberringa: "Proteomic Profiling and Analytical Chemistry, 1st Edition The Crossroads"
Nowy podręcznik prof. Silberringa: "Proteomic Profiling and Analytical Chemistry, 1st Edition The Crossroads"
Proteomic Profiling and Analytical Chemistryhelps scientists without a strong background in analytical chemistry to understand basic analytical principles and apply them to proteomics profiling. In most proteomic profiling experiments, liquid chromatography is used; this method is also used widely in analytical chemistry. This book bridges the gap between overly specialized courses and books in mass spectrometry, proteomics and analytical chemistry. It also helps researchers with an analytical chemistry background to break into the proteomics field. Proteomic Profiling and Analytical Chemistryfocuses on practical applications for proteomic research helping readers to design better experiments and to more easily interpret, analyze and validate the resulting data. Experimental aspects such as sample preparation, protein extraction and precipitation, gel electrophoresis, microarrays, dynamics of fluorescent dyes, and more are all covered in detail. Pawel Ciborowski received an M.S. degree in biochemistry from the Warsaw University. He received a Ph.D. in bacteriology/biochemistry in 1983 from the National Institute of Hygiene in Warsaw. After spending two years as the Alexander von Humboldt Fellow at the University of Cologne and two years as Visiting Scientist at the University of Lund, he came to University of Pittsburgh . Since 2003, he is a faculty member at the University of Nebraska Medical Center where he conducts his own research and directs Mass Spectrometry and Proteomics Core Facility. He is the author of over 70 papers and reviews as well as several contributions to books and textbooks. His research is focused on the correlation of structure and function of proteins, their receptors and the impact of posttranslational modifications on their functions in understanding molecular mechanisms of pathological processes and to apply this information in designing new strategies for disease prevention, early diagnosis, and control. Using state-of-the-art techniques in proteomics, he is investigating the structure and function of proteins which are involved in: (i) response to changes in cell's environment, (ii) response to stimuli such as tissue injury, infection, drug treatment, (iii) during malignant transformation. He is teaching biochemistry, mass spectrometry, and proteomics. Jerzy Silberring was educated at the Jagiellonian University, where he received a Ph.D. in chemistry in 1978. Later on, he received a docent of biochemistry title at the University of Uppsala in 1991, and became a full professor of biochemistry at the Jagiellonian University in 2001. He spent 10 years at the Uppsala University and Karolinska Institute in Stockholm. He is the author of over 200 papers and reviews mainly on proteolytic enzymes, neuropeptides, neurobiology of pain and drug dependence, proteomics, and mass spectrometry. His investigations have contributed to our understanding of the regulation of neuropeptides and their fragments, discovery of novel peptides, and applications of mass spectrometry. He is teaching biochemistry, neurobiology of behavior and drug dependence at the AGH University of Science and Technology, Jagiellonian University, and Centre of Polymer and Carbon Materials, Polish Academy of Sciences.